What if the actuator is not moving? If the actuator is not moving, there are several things you can check on. Make sure that all plugs are plugged in their respective ports as shown in the manual. Make sure that the battery is fully charged. Make sure that the red emergency button is in the up position. Make sure that the control box lights up when you insert the battery. *For all control boxes, the actuator will not work if the charger is plugged into the control box. Once you have completed all items on the check list and the problem continues, please contact customer service for further assistance. What if the actuator is not moving and the motor is making a sound? If the actuator is unresponsive but the control box’s LCD screen is showing the up and down arrow and the actuator is also making a sound. Then please contact customer service for further assistance. Sometimes the actuator will need some weight to retract the boom. 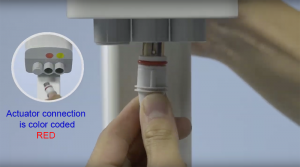 What if the actuator stops during a lift? If the actuator stops during a lift, check if the red emergency button has been activated or if the battery needs to be charged or if the lift is overload. *Note that the actuator will not work if the control box is being charged. What if I hear a grinding noise from the actuator? All actuators will produce a low volume hum but if your actuator is starting to produce a different sound than when you first started to use it, it means that the internal gears maybe stripped and it is time to replace it. What if the actuator is making a clicking sound? Verify that the source of the clicking sound. If the sound is indeed coming from the actuator, then the actuator is defective and you need to replace it. If the clicking sound is coming from the control box and the actuator is not moving, then you need to make sure that the plug is all the way in the ports on the bottom of the control box. What if my actuator only goes in one direction? If the actuator only works in one direction, double check to see if the buttons on the hand control or control box are stuck. Each time you change direction, you should hear a click from the control box. Try just using the hand control, if the hand control works, then you may have a defective control box and you will need to contact customer service for further assistance. Sometimes it could be because the control box or handle control is defective or the PCB on the control box is defective. At which time you should contact customer service for further assistance. What if the boom does not come down? Sometimes the bolt is too tight on the boom to mast connection and you just have to readjust enough so that the boom can come back down without weight. What if the actuator is connected and the control box clicks but the boom will not move? If the connection is all the way in and the control box clicks. So recharge the battery overnight. If the problem continues then it could be a defective actuator, so please contact customer service for further assistance. What if the LCD screen does not light up? If the LCD screen does not light up, it could be that the battery is dead and you will need to charge it overnight. If the problem continues, please contact customer service for further assistance. If you know that the battery is fully charged and the control box is still not lighting up, then your control box is defective. Please contact customer service for further assistance. What if the LCD screen lights up but is blank? If your screen is lit but it does not show any icons, then it is a defective control box. Please contact customer service for further assistance. What if the control box does not make a click sound? The control box should make a click sound each time you go up or down. If the control box stopped doing it, Then it is time to replace or contact customer service for further assistance. What if the control box only reads “Attention recharge or exchange”? If your screen shows “Attention recharge or exchange”, it could mean that your battery is low or there is no battery in the slot or that the red emergency button is in the down position but if you are trying to charge the battery and it reads “Attention recharge or exchange” then please contact customer service for further assistance. What if I hear three long slow beeps and my lift has stopped working? Those beeps indicate that the safe load limit has been exceeded and you should lower the patient immediately for their safety. What if the battery constantly needs to be charged? If the battery constantly needs to be charged, it is because the battery is old and cannot hold charge much longer. You will need to replace the battery cells. The batteries should be changed every 18 – 24 months depending on usage pattern. What if I hear beeping every 2 seconds and the lift has stopped working? The two short beeps indicate that the batteries need to be charged. What if I hear three short fast beeps and the lift has stopped working? The three short beeps indicate that the batteries need to be charged and if the problem continues then the batteries need to be replaced. What if I charged my battery overnight and the battery is still not full? Make sure that the red emergency button is in the up position. 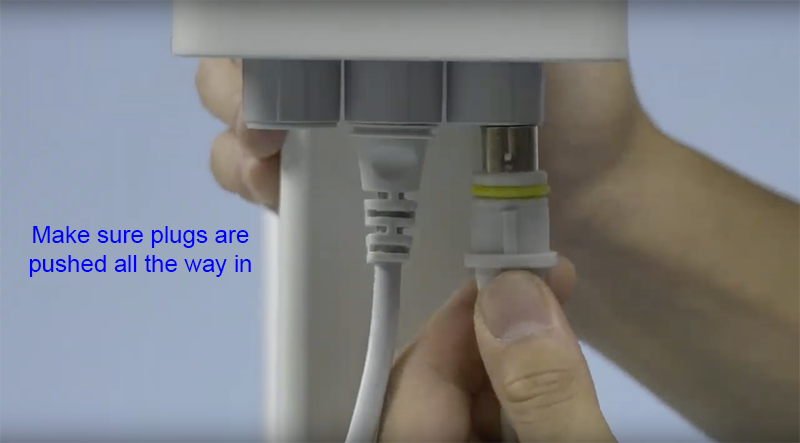 Also make sure that the charger plug is all the way in the port of the control box. All of the plugs are stiff in their initial use and sometimes it makes it harder to plug it all the way. The charger will have an indicating light on the wall mount, it should start out green. If the battery is not full, then the wall mount light will change to amber and there will be a lightning bolt symbol on the control box to indicate that it is charging the battery and once the battery is full the light will turn green. What if when I use the hand control but the actuator is not moving? 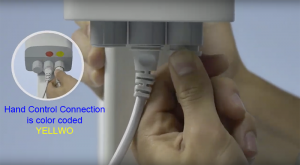 Make sure that the connection from the hand control to the control box is all the way in the port. The green LED will light up when you press the up or down button. If you hear a click from the control box and the actuator is still not moving, then check the control box buttons to see if you can operate the lift from there. If you can operate the lift from the control box but not the hand control, then the hand control is defective and it needs to be replaced. What if my pump does not extend? Make sure that the valve is closed so that when you move the pump handle, the pump will extend. Sometimes air can get trapped in the pump which will cause the pump not to extend. In that case, you should release the valve and move the lever ten times up and down to get rid of the excess air. What if my pump does not move down? Make sure that the valve is in the opened position and that the boom to mast connection is not too tight and applies some pressure on the boom if the lift is unloaded. What if the seat lock does not work? Make sure that the hole in the seat pad is in line with the hole on the lift. If they are not, please contact customer for further assistance. What if I installed the kneepad on my SA lift and it rotates up and down? The kneepad can pivot up and down just a little bit to accommodate different knee and leg positions but it will be secure once the patient applies weight onto the knee pad.